Beirut (Lebanon) (AFP) - Israel's strike on a Syrian airbase this week has put it in direct confrontation with regional foe Iran, the head of Lebanon's Tehran-backed Hezbollah movement said on Friday. "The Israelis committed a historic mistake... and put themselves in direct combat with Iran," Hassan Nasrallah warned in a televised address. Seven Iranian personnel were killed in Monday's early-morning strike on the T-4 airbase in Syria, but Tehran had not specified which units the fighters belonged to. On Friday, Nasrallah said the casualties were elite Iranian Revolutionary Guards, making the strike the first time in Syria's long-running conflict that they were intentionally hit by Israel. "This is unprecedented in seven years: that Israel directly targets Iran's Revolutionary Guard," Nasrallah said. "This is a turning point for the region, and what came before is not what will come after," he warned. In Israel, the army said Friday that an Iranian drone it which infiltrated the country from Syria before being shot down had been armed with explosives and was primed to carry out an attack. Israeli warplanes had retaliated the same day, attacking the "Iranian base" inside Syria from which the drone was allegedly launched. One of the planes was downed by Syrian air defences, crashing in Israel as its two pilots were hospitalised. Israel is believed to have carried out numerous raids inside Syria since 2013 but it rarely admits to them publicly, although it does say it wants to curb Iranian influence in Syria. It declined to comment on accusations by the Syrian and Russian governments that it was behind the T-4 strike. Russian, Iranian and Hezbollah fighters have a presence at the T-4 base, according to the Britain-based Syrian Observatory for Human Rights. The Observatory said a total of 14 fighters, including Iranians, died in the strike. No Russians were reported to have died. The strike came just two days after a suspected chemical gas attack which killed more than 40 people in a rebel-controlled town outside the Syrian capital. The alleged use of poison gas prompted US President Donald Trump and other Western leaders to threaten military action against Syria -- something Nasrallah shrugged off on Friday. "Let the whole world know that Trump's Hollywood-style tweets and threats have not, and will not, scare Syria, Iran, Russia, or the region's resistance movements and peoples," he said. 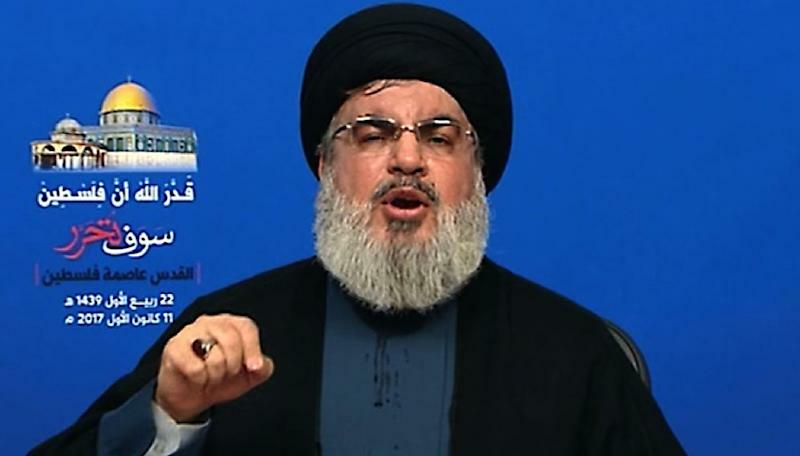 Nasrallah echoed Syrian and Russian government denials that President Bashar al-Assad's forces were behind the attack. Douma was the last rebel-controlled town in the devastated suburb of Eastern Ghouta, which Assad is now poised to declare fully in government hands after a two-month assault. "Why would the victor use a chemical substance?" Nasrallah asked.